My publishers advised that today would be a good day to release my memoirs. Should be able to get plenty of time on Newsnight and Boulton as its a slow news day. At last, after months of waiting, the most sensational political memoirs of the last thirty years are available. 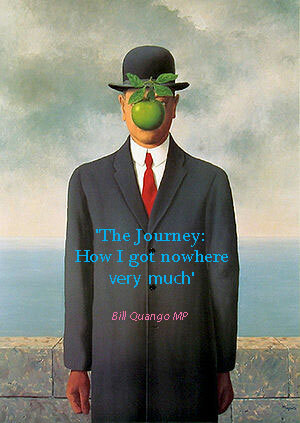 Bill Quango MP charts his meteoric rise from head down, nose clean, backbench MP to hand out, keep mum, backbench MP. Rising from a lowly post on the 1983 metropolitan parking meter provision committee to head of the 2009, 18 week study into Caribbean energy schemes and how it could provide options for the Midlands, Bill Quango has seen Prime Ministers come and go..
"Hello erm..Mr..errr....I was just going out"
Bill Quango was right there during ERM Black Wednesday ..
"Hello Norman. I've got that white paper on Fish n' chip wrapping. We're going to advocate 40 g/m2 pulp grade." "Yeeess..very good. Would you mind popping back old chap? Bit busy at the moment." And he continues in the frontline of the backline even today. Iain Duncan-Smith stopped by the office today in need of my assistance. "I need some help with my historic welfare reform proposal, Quango. May I borrow your stapler?" I particularly enjoyed the anecdote on page 129 where you accidentally gave the blue plastic cover of the dodgy dossier to TB, thinking he was a foreign diplomat. Or P345. The Iraq war. "We need you to vote yes, Quango." "I couldn't possibly go against my principles." "Hmm... That issue with conflict of interest with BQ Industries applying to purchase some land and build a shopping centre on top of the existing playing fields of the local school. That may be something we can help with?" "you know, I think we should be tougher on dictatorship states.."
I tried to buy a copy this morning ... but they'd sold out. I also enjoyed your principled stand against 90 day detention because you thought that that meant it would be the end for boarding schools. and you joke about the Foxhunting debates being like a glacial mint - fabulous! So very kind, all of you. Shame there was no room for the MPs expenses scandal and Billy Hague's forays at the Brighton conference story. Maybe in the next edition..
Now I'm off to the telly. BBC says they couldn't get me on the One Show, but they have another similar program on the BBC 4 AM wavelength called the Big Cook, Little Cook show. Just as good so they say..
Y Ddraig Goch said: "I tried to buy a copy this morning ... but they'd sold out." You can get 5 for a pound at Poundland. Knew you'd be in there swinging, Bill. Like Bradshaw's Railway guide, essential reading.